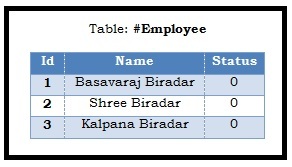 To understand the looping of the table records in the above listed scenarios, let us first create a temporary table #Employee as shown in the below image with sample data using the following script. 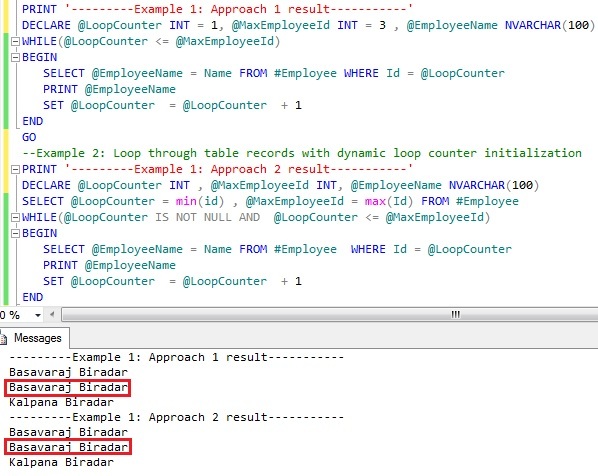 The below examples illustrates how we can loop through table records in various ways. And also highlights the problem if any. Please go through all the examples before deciding on using one particular approach. 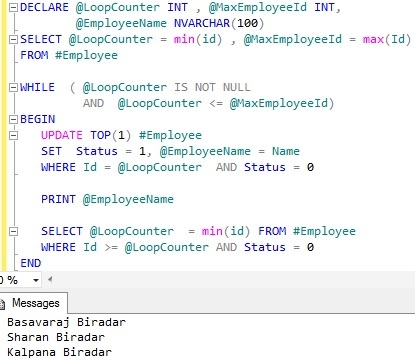 In this example the loop running variable @LoopCounter and the maximum loop counter variable @MaxEmployeeId values are initialized with a static value. 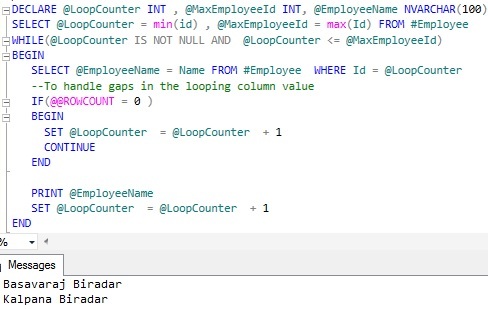 In this example the loop running variable @LoopCounter and the maximum loop counter variable @MaxEmployeeId values are initialized dynamically. Issue with example 1’s approach 1 and 2: These example approaches are assuming that looping column values doesn’t have any gap in it. Let us see what is the output of the example 1’s approach 1 and 2 if we have gaps in the looping column value. 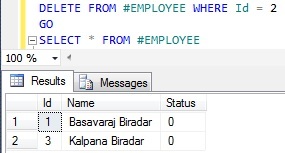 Now let us run the example 1’s approach 1 and 2 script on #Employee table which is having gap in the Id column value (i.e. record with id column value 2 is missing). 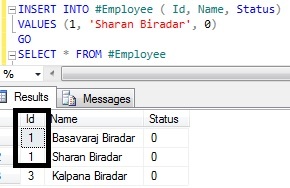 From the above result it is clear that the example 1’s approach 1 and 2 script will not work in the scenarios where we have gap in the looping tables column values. This problem can solved in multiple ways, below are two such example approaches. I would prefer the first approach. 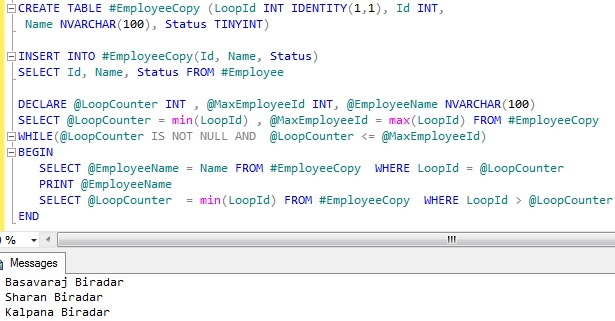 From the above result it is clear that this script works even when we have gaps in the looping column values. 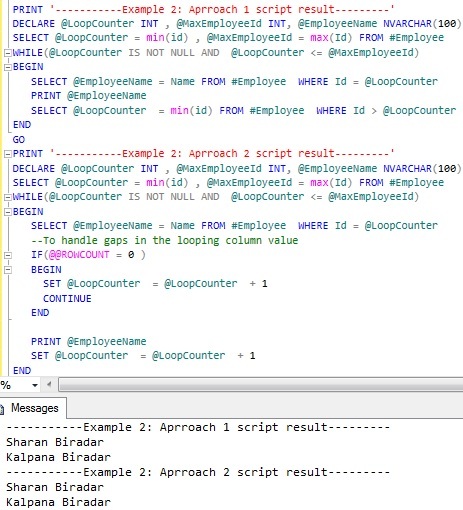 From the above result it is clear that the example 2’s approach 1 and 2 script will not work in the scenarios where we have duplicates in the looping column. Here only one record of the employee with id =1 is displayed and other record is skipped. This problem can solved in multiple ways, below are two such example approaches. In this approach using the Status column to mark the records which are already processed. And also the update statement is used to update the status and also get the row values and one more thing is in Update using the TOP statement to update only one record at a time. In this article I have covered most of the basic scenarios which we across. If you have any other scenario and use different approach, post a comment I will update the article. Thx for this article! It helped me a lot! Well explained. Thank you for sharing! 5 Stars (from Portugal). Well explained. Thank you for sharing!